As an instructional designer you’re always looking for ways to make learning content more engaging. But, at the same time, you still need to focus on improving performance. So a random “game” template where a soccer ball gets kicked through a goal every time a quiz question is answered right probably isn’t the right solution. So how you do you incorporate game design with good instructional design? 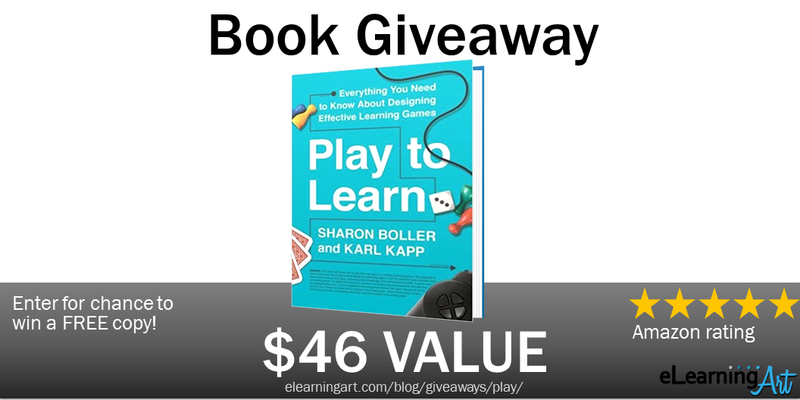 I asked Karl Kapp, a world-class professor and author of several highly rated books on learning games and gamification, to share his best advice with me. 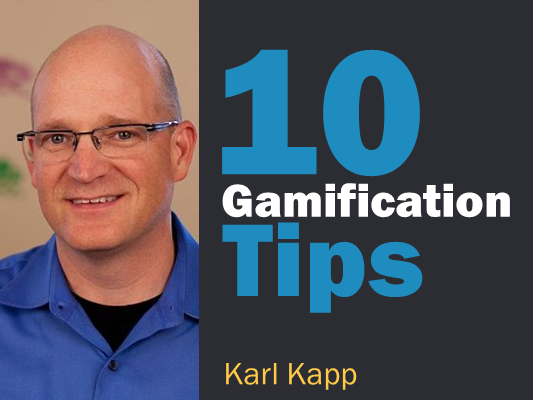 And I’ll share his top 10 gamification tips with you in the interview below. How has traditional eLearning failed? 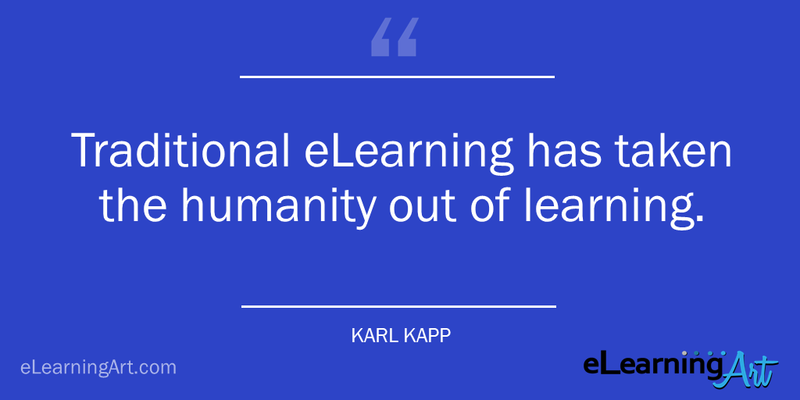 I think traditional eLearning has taken the humanity out of learning. We took the worst of classroom instruction (slides, bullet points, lecture) and automated it. Traditional eLearning forgot about emotions, motivation, peer-to-peer discussions and interactivity. Traditional eLearning forgot about the energy that comes from overcoming a difficult challenge or the thrill that a person gets when they master a difficult subject–these are things that excite learners. A few sterile learning objectives, a little bit of bulleted content and then a multiple choice question is not way to engage, excite or motivate learners. And what’s a better solution? Games and gamification are a much better approach. Learning games provide context, engagement, challenge and the thrill of mastery. Gamified solutions provide the right mix of engaging elements from games like a sense of progress or immediate feedback and visible signs of improvement over time with content to motivate learners. Is gamification just “fun” with points, badges, and leaderboards? Two things about the question. 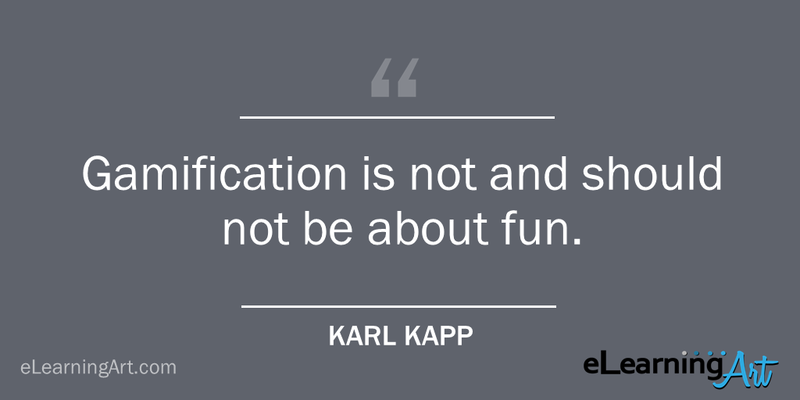 One gamification is not and should not be about fun. It should be about engagement. Let’s think of gamification as a way of taking motivating elements from games and weaving those elements into instruction. These are elements like feedback loops, characters, freedom to fail and mastery of content. Second, the least motivating elements of games are points, badges and leaderboards. These elements can be part of a gamified solution but should not be the focus. If points don’t provide feedback on how well a learner has mastered a concept and badges are not tied to a difficult but achievable behavioral skill and leaderboards are just filled meaningless accumulated points, then the gamification effort is wasted. Learners won’t learn or be motivated. Gamification, to me, is a design affordance. It’s a way of designing learning that makes it engaging, it’s not the artificial application of a game layer like points, badges and leaderboards on top of instruction. Rather it’s the systematic and deliberate act of making learning engaging through the careful interweaving of game mechanics, dynamics and elements into the design of instruction. What’s the business case for gamification? The best business case is engagement. I rarely use the word game or gamification with CEOs but I do talk about active, focused and deliberate practice and I talk about outcomes. If designed properly a game or gamified approach will encourage employees to practice desired skills and focus on obtaining desired learning outcome which translates into on-the-job performance. Most traditional eLearning is forgotten within hours. What is the business case for that? When you describe how focused and deliberate practice or reminders focus employees on the desired behaviors and outcomes, typically the reaction is highly favorable. Should all training be gamified? But nor should all training be lecture or video or anything. 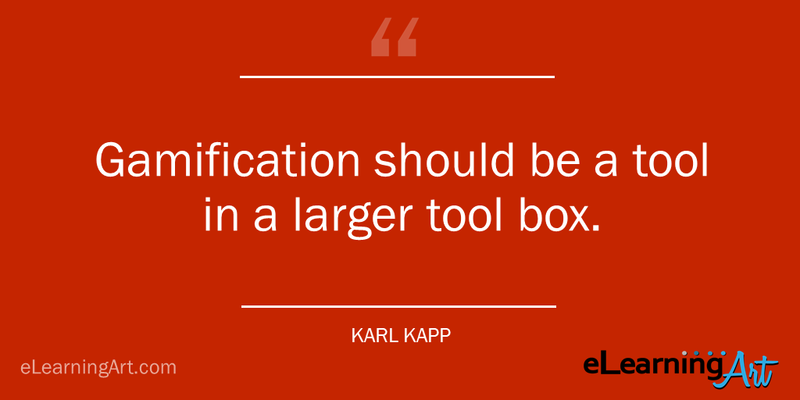 Gamification should be a tool in a larger tool box and implemented when appropriate. However, we should strive to make all learning engaging, mastery focused and motivating, so, OK, maybe yes in that sense. .
Should I be creating soccer game quizzes? I don’t think I should. Yes, if you are teaching about soccer rules and regulations, it would be very appropriate. If you are teaching about financial compliance regulations–then you are correct, it’s not the right way to teach that content. 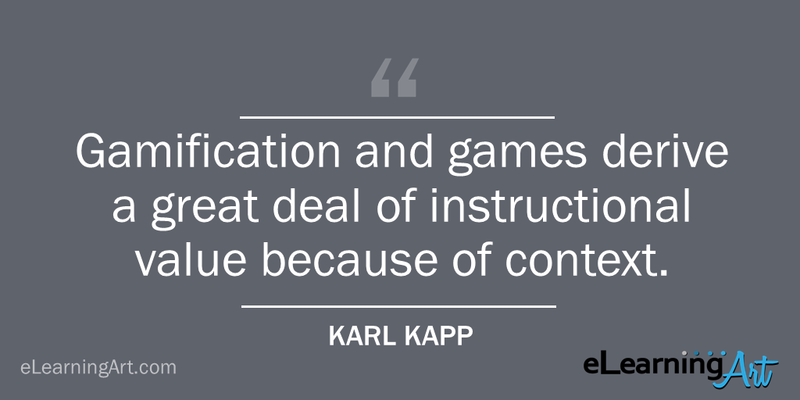 Gamification and games derive a great deal of instructional value because of context. The game that’s being played should reflect the content to help make it resonate with the leaner. If there is too much disconnect between the game and the learning content or context then learners will quickly dismiss the game or gamified effort as a waste of time. Now, if you are using the game to grab the learner’s attention, attempt to clear their mind prior to content or to motivate them to participate then it could be appropriate, again, it depends on the context of how the game is being used. What role do stories play in learning? Stories play a huge role. In fact, some research indicates that learners remember facts better if they are presented in a story rather than presented in bulleted list. 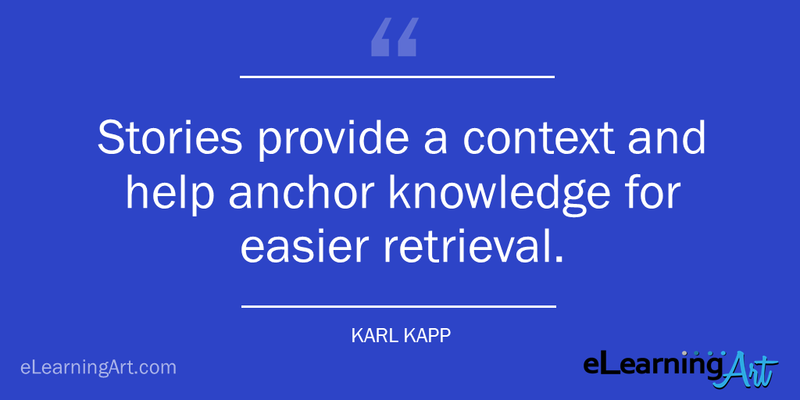 Stories provide a context and help anchor knowledge for easier retrieval than lists or tables. What’s the best corporate gamification example? One successful gamification experience that is near and dear to my heart revolves around content gamification. It is the creation of a sales learning platform called Zombie Sales Apocalypse which is being used by insurance and pharmaceutical companies (full disclosure, I helped develop the platform). The platform is a combination of games and gamification with elements of each. 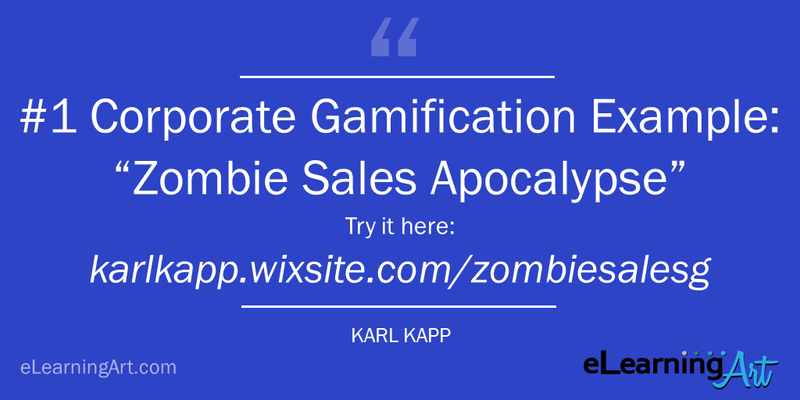 The Zombies Sales Apocalypse platform is an interactive sales training tool that uses content gamification to immerse the learner in a 3D environment focused on building sales skills in a simulated sales situation – with the added danger of avoiding zombies. The sales training tool is built on a foundation of academic research revolving around games and gamification for learning. So the player has to make a successful sale to slip the zombies the anti-virus. So the entire experience is a branching simulation where the learner responds to questions from people within the environment and if they respond incorrectly, the zombies emerge. While not everyone “loves” the game because of the zombie content. Many people have enjoyed it and the result, for the most part, has been enthusiasm and a bit of learning by the sales reps. Also, managers can view a sales reps performance within the experience and use that data to help coach and guide their sales force to success because they can see the results of the sales reps and then can provide feedback based on an analysis of those game results. Is special software required to build a gamified course? 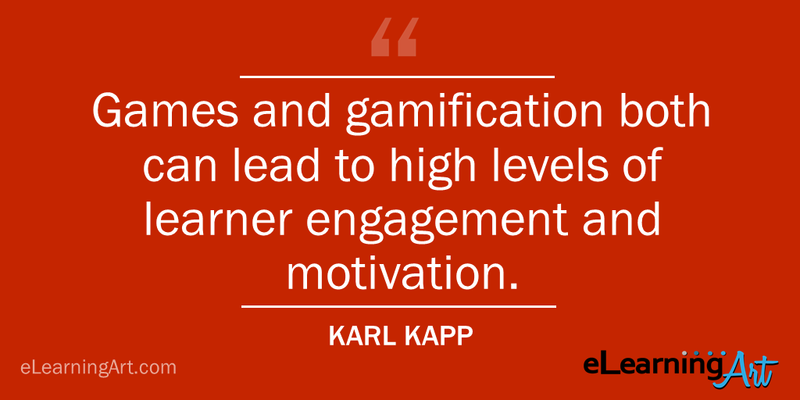 So I think of two types of gamification. One is Structural Gamification which is putting a game structure around content without altering the content itself. This is often associated with Points, Badges and Leaderboards. You earn points, for example, for watching a video or answering a question. There are gamification platforms for these activities so that you don’t have to program the gamification structure from scratch. These platforms are templates for entering in questions and activities for the learners. To name a few: Axonify, Badgeville, Bunchball, GamEffective, Insite Hub, Knowledge Guru, MindTickle, mLevel, Qstream. 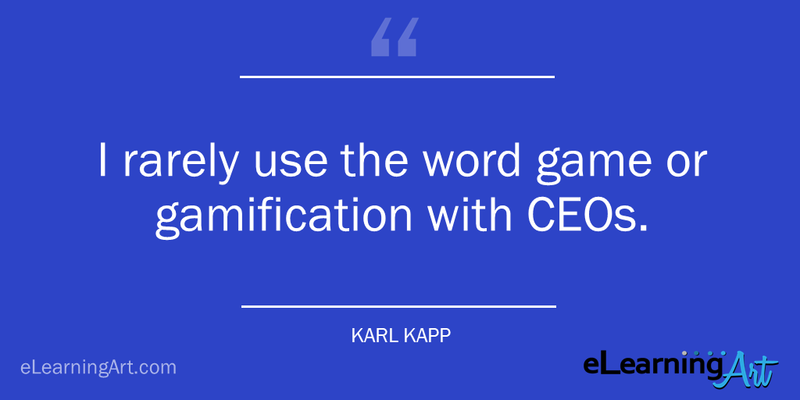 The second type of gamification is Content Gamification. This is the act of taking content and actually make it more game like. So, the use of stories, characters and challenge to engage and motivate learners. You might craft a scenario with a few characters and challenge the learner to figure out which character made the compliance mistake and you might wrap that story into a mystery and even involve a detective. 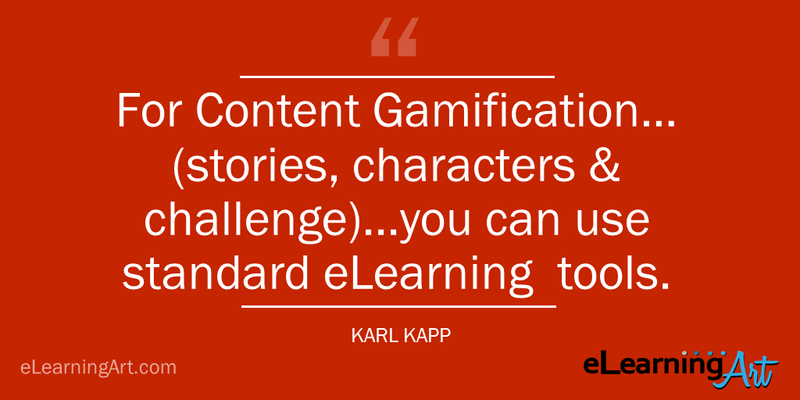 For content gamification, you can use standard eLearning development tools like Articulate, Captivate, Lectora, and other authoring tools create good gamified courses. The secret here is in the design. What’s your best, practical tip for someone looking to incorporate gamification into their instruction? 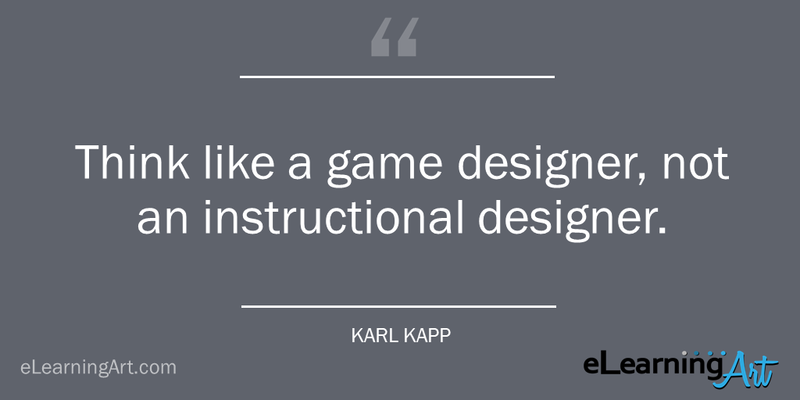 Think like a game designer, not an instructional designer. Start with action or performance first, not with content. Ask yourself or SME what do you want the learner to be able to do as a result of the game or experience. Then design backward from that action or performance to eventually get to the starting point of the instruction. This backward design helps to streamline the process and focuses the development team on action and performance.